London’s King’s Cross is currently the centre of one of the most exciting and significant redevelopment projects underway in Europe. The landmark development, lead by the King’s Cross Central Limited Partnership, will bring to market 50 new buildings, 2,000 residential units, 20 new streets and 10 new public squares. Forecast to be completed in 2020, the development will house some 45,000 people, who will live, work and study across the 67-acre site. 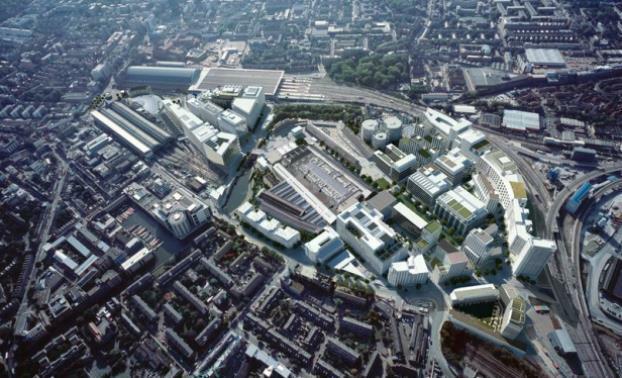 Residents, workers and visitors will spill out of the Grade 1 heritage listed King’s Cross Station and be drawn by the strategic placement of Google’s new UK headquarters, situated on King’s Boulevard. Allford Hall Monaghan Morris-designed building will boast a huge interactive showroom, internal climbing wall, indoor football pitch and rooftop swimming pool for its 4,500 occupants. The 11-storey, 300m long building has already gained planning approval and is so large it has been dubbed ‘the landscaper’. The development has also triggered a string of high-profile moves by technology and financial groups. Previously at the industrial heart of England, King’s Cross now boasts extraordinary character and heritage in its built form. The redevelopment of what was previously a derelict, red light district utilises the iconic coal drop stations, gas works, Regent’s Canal and King Cross Station as focal points that add to the cultural integrity of the development. At a commercial level, King’s Cross is already developing a buzz with customers queuing for Caravan - an Australian-owned and operated café - 30 minutes before its weekend openings. The new shopping precinct will be housed within the coal drops, an abandoned industrial site that has a layout and setting perfectly suited to retail-style development. The shopping quarter will offer everything from market style street-shops to high-end fashion boutiques, all within an area boasting huge amounts of public space. Argent driving the development, the project has achieved record sales. In 2012, the development sold $4.48 million (£2.4million) in retail properties within the first four weeks of opening. The trend of station shopping is growing fast throughout London, with railway stations consistently outperforming those on the high street. The sale of residential properties, which range from top-end apartments to more affordable student accommodation, have also performed well. In an ever-stabilising economic market, the King’s Cross development has become the new “play area” for investors worldwide.